Looking for where to buy the best Pilates equipment for your home or commercial gym? Ntaifitness® is your one-stop Pilates equipment depot! Visit a fitness equipment store near you or shop online. 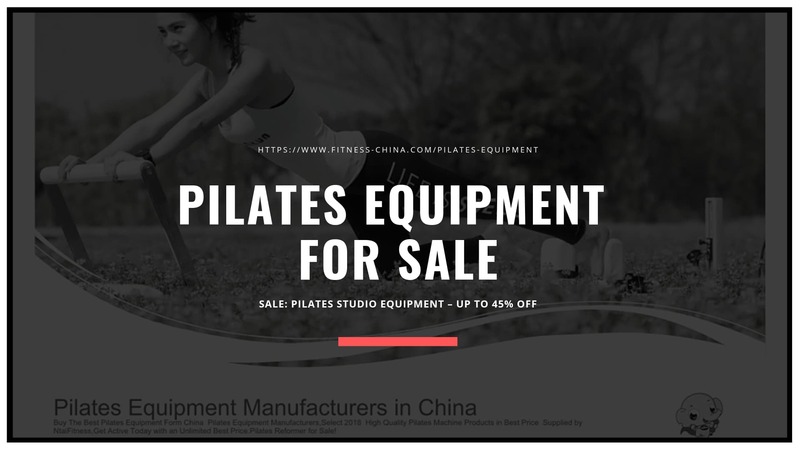 Buy The Best Pilates Equipment Form China Pilates Equipment Manufacturers, Select 2018 High-Quality Pilates Machine Products in Best Price Supplied by NtaiFitness, Get Active Today with an Unlimited Best Price. Pilates Reformer for Sale! Pilates (pronounced "puh-lah-they") is a system of over 500 controlled exercises that engage the mind and condition the total body. It is a balanced blend of strength and flexibility training that improves posture, reduces stress and creates long, lean muscles without bulking under the careful supervision of a certified Pilates instructor, either one-on-one or in small group sessions. These professionals are highly trained specialists who know how to tailor a Pilates program to meet individual needs and abilities, monitoring movements to ensure correct form for optimum results. As Pilates grows in popularity, Pilates classes are being offered not only at specialized studios but also at gyms, health clubs, spas, rehabilitation clinics, senior facilities and community centers around the world. There are also plenty of Pilates videos on the market, - such as the Winsor Pilates, Stott Pilates and the Gaiam Living Arts Series - that allow you to experience the strengthening, stretching and toning techniques right at home. Compared to yoga postures, Pilates poses are strikingly similar, yet there are some profound differences. The Pilates method is a complicated system of effective but gentle whole-body conditioning and corrective exercises. It was first practiced by dancers and gained mass attention in recent years because of its largely aesthetic body sculpting effects. Yoga is a lifestyle, rather than simply an exercise. It's known as the path to both physical and mental well-being. It includes everything from physical postures and healthy diet to breathing, relaxation and meditation skills. Breathing and concentration are fundamental to both practices; however, yoga employs breath on a deeper level. The slight difference between them is that Pilates instructs one to inhale through the nose and exhale through the mouth; while in yoga, one is taught to inhale and exhale through the nose only. Yoga has many different styles, but all are generally performed in a group setting on a yoga mat with the aid of a yoga instructor. Pilates has a full component of mat work, but it also incorporates work on Pilates machines which help build a longer, leaner, dancer-like physique. Cotton fitted clothing is recommended for both Pilates and yoga practitioners. Pilates method doesn't rely as much on extra props - such as blocks, straps, blankets, etc. - as yoga does. For Pilates beginners, the exercises are hard at first because your body will need to adjust to the feeling of using supporting muscles for the balancing and strengthening movements. Start practicing slowly, as your body allows, and more exercises can be added to your routine once your body adapts. Almost everyone can do Pilates. The Pilates classes are usually held through fitness centers or local gyms. Most of them incorporate mat work in the total workout (which means you do your workout on the mat) and sometimes balls are used in beginners classes. You will be taught to concentrate on your muscles and instructors will guide you through each move and explain why you're performing each move and what your body is doing. Some advanced classes offer machine work for Pilates students. The machines can improve and intensify your workout by using your own body as resistance. If your class includes machine work, make sure your instructor is certified, so that he/she can teach you proper, effective and safe poses. To ensure your comfort, wear cotton clothes - such as a T-shirt or tank top and shorts - during practice. Shoes are not necessary. When you perform the poses, every movement should be slow, but flexible and strong. Since Pilates is commonly performed at a leisurely pace, you might want to pair Pilates workouts with another more intense aerobic exercise - such as swimming, running, cardio machines (elliptical, stepper or cross trainer) or brisk walking to get your heart rate going. German-born fitness innovator Joseph H. Pilates (1881-1967) developed the Pilates exercise system in the 1920s. His interest in physical fitness stemmed from a determination to strengthen his own body and improve his health after a sickly childhood. With a background in yoga, Zen meditation, martial arts and other ancient fitness techniques plus some success as a gymnast, diver, and boxer, Joseph Pilates devised a unique sequence of movements that worked the mind and muscle in harmony. After the war, Joseph Pilates moved to New York and with his wife, Clara Pilates, opened up a studio near the New York City Ballet in 1926. It wasn't long before he drew a following with dancers who took to Pilates for its ability to create long, lean muscles and a strong, streamlined physique. Legends Martha Graham and George Balanchine were among his clientele. In 1945, Joseph Pilates published Return to Life Through Contrology, which described his philosophical approach to exercise. Soon, some of his students began opening studios of their own - some making subtle adaptations to the method - and word of Pilates slowly spread. Pilates didn't really hit the big time, however, until the 1990s. The mind-body fitness movement took off as baby boomers started seeking gentler paths to health and wellness. Ancient techniques such as yoga and tai chi enjoyed a resurgence of popularity and Pilates followed suit. No longer that enigmatic workout on strange contraptions, Pilates' reputation broke free from elitist studios and started popping up at neighborhood gyms. Hollywood celebrities and top athletes started singing its praise and the press picked up the story. The Pilates "buzz" has taken on a life of its own, perhaps enhanced by Mari Winsor and that ubiquitous Winsor Pilates infomercial, but the positive results purport that this is more than a passing fitness fad. Joseph Pilates always claimed he was ahead of his time, and his legacy lives on beyond his wildest expectations. Beneficial for people of all ages, aptitudes and fitness levels, Pilates is more than a passing exercise trend. Pilates has enjoyed a recent surge in popularity, due in part to celebrity endorsements. After years of high-impact, make-em-sweat, feel-the-burn fitness workouts, there is a great appeal in a slower, safer, sensible approach to health and wellness. Pilates conditions the body from head to toe with a no- to low-impact approach suitable for all ages and abilities. It requires patience and practice, but the results will follow. Improve strength, flexibility, and balance. Enhance mobility, agility, and stamina. Pilates exercises can be performed on a mat, with literally hundreds of beginner to advanced moves available in the repertoire for a well-rounded workout on the floor. However, there are five major pieces of specialized Pilates equipment, the Pilates Reformer, the Jedi pull or the modern Pilates Resistance Bands, The Pilates Cadillac, The Pilates Barrel, and The Pilates Chair- plus a few smaller accessories or Pilates Props - that can add a whole new level of interest and intensity to the Pilates experience. Some Pilates equipment, like the classic Pilates Circles, offer spring resistance, others like the Pilates Spine Supporter, offer support, and a variety of unique exercises for the total body can be performed on each piece. Again, a purely mat-based routine is an authentic and effective Pilates workout by itself, but if you have the opportunity to explore some Pilates equipment under the guidance of a trained professional, do so! Pilates exercise is a series of exercises designed to improve strength and flexibility through repeated stretching and balancing. Some manufacturers that design and sell the necessary Pilates props (mats and rings) and equipment (reformers and Wunda chairs) can help you bring Pilates home or send you running with a sore spine. you see, inventing Pilates equipment was at first rather rudimentary business. Joseph Pilates invented his first Pilates machinery constructed crudely of hospital beds with springs and strings haphazardly attached. Various pieces of equipment were created thanks to Pilates, but today Pilates enthusiasts have joined efforts to make these machines safer, more affordable, more convenient, more efficient and more comfortable for the average Pilates student. Due to its popularity and the increasing demand for equipment, almost every Pilates manufacturer was compelled to develop their own Pilates pieces in the beginning. The main Pilates equipment pieces are available on our website. Click on the links to learn more about each piece! Click an option above to see gear specs, pictures, customer ratings, and more. best home workout equipment .